Few days back my husbands's one of old colleague and his family were coming for lunch and unfortunately, there were power cut for whole day. Normally, I don't use any readymade wet masalas but current was not there to grind any thing, I was totally confused what to do? My pre-planned lunch idea was completely flopped. HA! HA! I re-planned and planned to cook Chinese food for them which do not require grinding masala. I made vegetable fried rice and chilli paneer for them along with a south Indian touch of curd rice.My idea was not effortless and every thing was perfect.I am just sharing the chilli paneer recipe today. Cut paneer in small square size. The batter should be like dosa batter which gets easily coated to paneer. Now heat oil in a pan. Deep fry paneer in medium heat till it is cooked and remove in kitchen towel to soak extra oil if any. Cut onion and capsicum in small cubes. Now heat 2 tbs oil in a pan and add chopped ginger garlic in it. Now add cut onion and capsicum with green chilli. Fry them in high flame. Add all the sauce with salt, black pepper and ajinomotto. Now just put the fried cubes of paneer in this and mix well. Cook in high flame for another 5 minutes. Switch off flame garnish with coriander or spring onion. 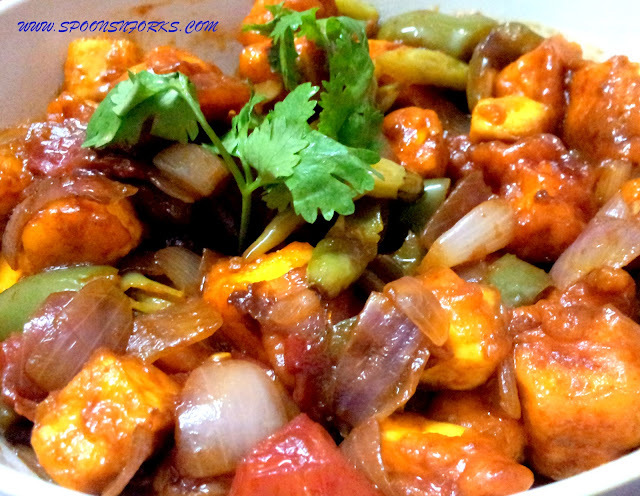 yum yum lip smacking chilli paneer. Wooow...esta receta me encanta es una delicia,abrazos y abrazos. I'll happily have this delicious chilly paneer with a bowl of rice. Wonderful looking paneer. Look very forward to trying. Thanks so much for sharing. Awsme information, I had come to know about your website from my friend vishwas.